No money due for 30 days on all credit card releases by phone. 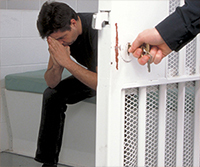 Getting released on bail is not as simple as one might expect. There are several different types of bonds, requirements, and ways in which bail may be granted. The staff at Sacramento Bail Bonds understands you may have a lot of questions, and we are always happy to provide quick, confidential answers. Our agency has been a Sacramento institution since 1926, helping generations of Californians get out of jail and back to their families and friends. We know the system inside and out, and we always do everything we can to assure the swiftest and easiest release for our clients. Easy financing terms are available, so don’t wait; we’ll help you or your loved one get out of jail fast and at the lowest rates.